When time is of the essence, nothing beats email's speed, precision and urgency. 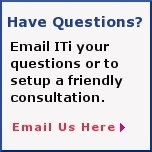 Let Saint Louis based ITi keep your prospects, customers, members and benefactors on top of late breaking developments with e-mail newsletters and announcements. Whether you're looking to send an e-mail newsletter, a high-impact email promotion, an email event invitation, an online survey, or build your email list, discover how Input Technology can help you. Design an attention getting Email using XHTML & CSS. Create and maintain your email list, track Opt-in/Opt-out requests. Include a micro site with an online form or survey. We can personalize each email message with the recipients info. Follow up hot responses with a letter, postcard, or custom sales kit. We track campaign effectiveness using Web Analytics and other tools. Email marketing and internet marketing is the fastest growing form of direct marketing. Think about including a web page with added contact information to your next direct mail postcard. With micro sites and Personalized Urls clients enjoy increased return on investments.